Nothing like weather and honest use. to "age" the new nuts and bolts on my pickup body I soaked them in Radio Shack etching acid (used for electrical boards)for a couple of hours. I then set them outside for a couple of days so them would get a coat of rust. 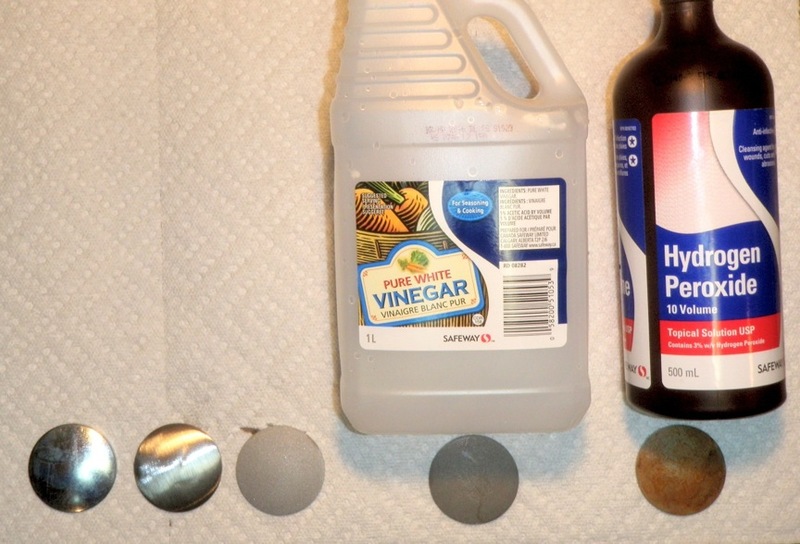 You can also use vinegar, but it takes longer. 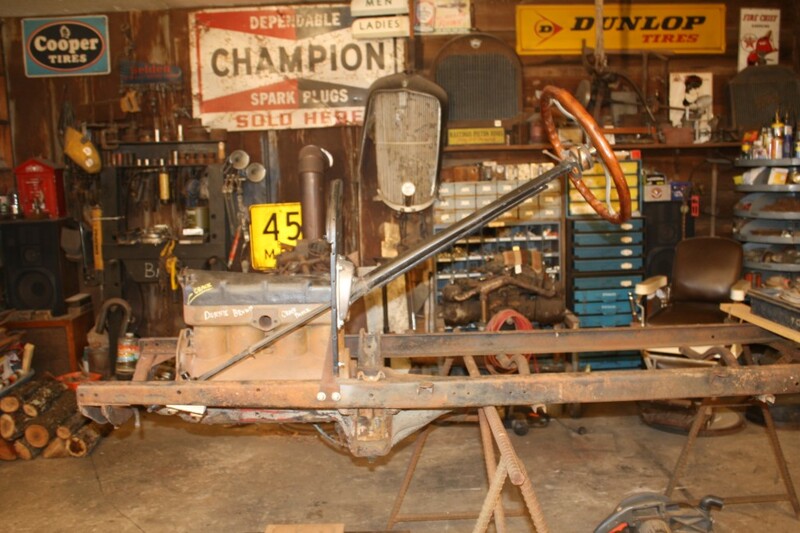 I would not worry about patina until you put some support under the front of the frame/engine. It looks like it is one straw away from smashing your toes. How about just building it as new then running the daylights out of it for a couple years? Earn that wear! Get yourself a couple gallons of Muriatic acid and place in a clean bucket with a sealing lid. nearby tools and other bare metal. Saying you want "faux patina" is kind of dangerous on this forum. Better of using another term such as "an aged look". Jim, Its hard to see, but there is a box just in front of the rear cross member with about 200 lbs of steel in it. I can almost put all my weight on the front cross member before it starts to tip. Also, the engine is just a block, pan and head. It may not look like it, but it is safe . I have a not so original trick, buy a "real" original barn fresh car. 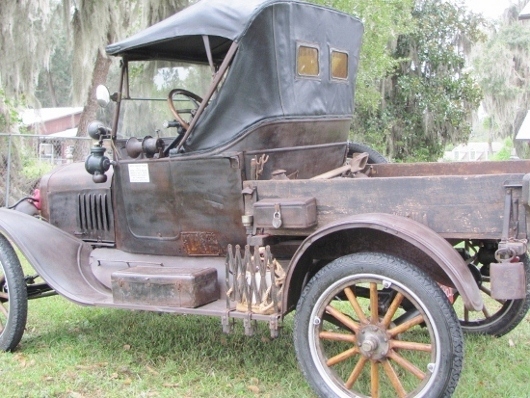 I did with my 1912 touring and problem solved. I have seen so called "freshly restored" barn fresh cars and they all look fake. 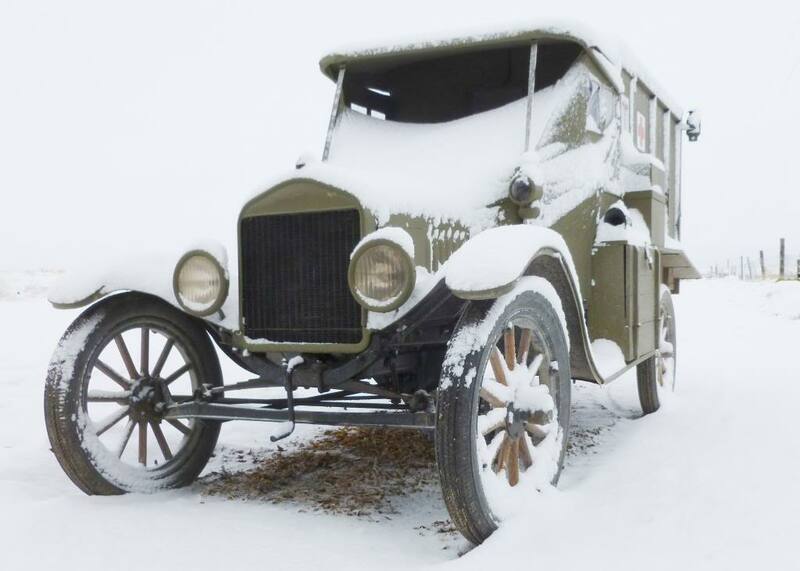 Some really high end restoration shops in the east have shown so called original barn fresh cars at Hershey and they stuck out like a sore thumb. There is no possible way to age metal 100+years and have it look authentic. PM Richard Eagle. He did a bang up job "patinaizing" his suicide door coupe. Boy, some of you guys are tough. 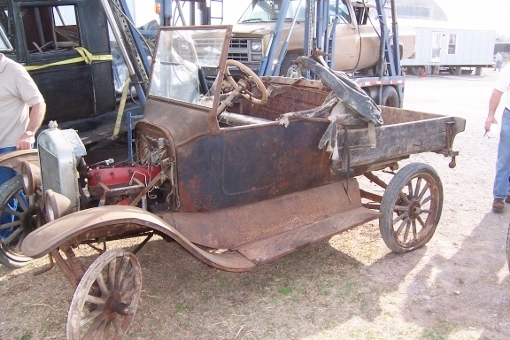 What is one to do when he has half a natural patina car and wants the rest to match. I totally get the "Authentic" and "Real" patina look, and a lot of us here want that. But having brand new parts will stick out like a sore thumb. Or like Donnie's case, welding excess holes up on a firewall. I wish more would help than to criticize. But I digress. Donnie, I would imagine an internet search will lead you to lots of aging type threads. I have little experience at this. I can tell you a few things. Muratic Acid is very strong. Simply dropping some bolts in will indeed take care of the plating, but I would not leave for more than a very short time (you'll have to experiment with this). The acid will eat at the threaded area and while the bolt will look ok, every dimension will be reduced including the threaded area which will result in loose threads and possibly worse, stripping of threads when tightened. It is very caustic, will rust anything around it when open to the vapors. I actually keep it as far away from anything I can even in a sealed container. But it does have it's use, just soak the heads to get the plating off. And while this trick seems like it will kill you to do, just leaving the vehicle and or parts outside with no cover will get the job done too. Eventually. The sun is brutal on painted parts over time and of course rain, snow, salt from snowy driveways, etc will all play into it. 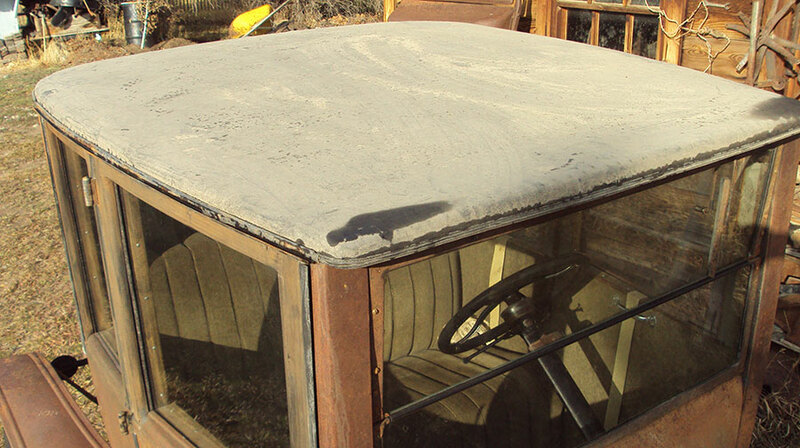 Also putting a cheap poly tarp on a vehicle will wear painted areas away on windy days. Painting items with thinner, fewer and incomplete coats of paint will also help when exposed to the weather. It will leave that evidence of color but allow the weathered look of items to show. Think about assembling items together and just shooting some light coats on one side of it, this will leave the other side bare and it will start to weather. I hope that helps some, and as smart a$$ as some of the guys were, they are truly right, weather, time and use will get that look your after. They way I see it, if you can help it along a little bit, so much the better. I for one won't bee here in another 100 years to see what it looks like and I would want to enjoy the completed vehicle now verses 50 or 100 years now when it "looks" right. Gun barrel browning solution does a good job of producing a nice crusty old rusted patina on nuts and bolts and other small parts that you can heat. You need to remove any plating first. Hot vinegar works pretty fast for me on the very lightly plated fasteners sold nowadays. Use the muriatic. You gonna be a sissy all your life? I washed the entire inside of a 65 foot yacht I bought that sank in New Orleans in 2005. But of course the hot wind was blowing down there too but it was humid. Toss the bolts into a plastic coffee can and roll them around for a few minutes, then let them air dry after a quick rinse with water out in the sun. I never even found the need to neutralize the wood job, just a water rinse, and got 15 coats of stain and varnish on it. to this day it looks new. Id do the sheet metal too but with a rag that you can throw away when done. The etching effect stops pretty fast unless you leave the sheet metal submerged for weeks as in don't use a steel coffee can... Do it outside as the fumes will rust any non plated tools as in saw blades and chisels etc. If you want to put on the plastic gloves and plastic pants, you can get away with wood bleach (oxalic acid). So now, you take some black latex house paint and apply it really lousy with a real hard old brush so it streaks all over. Let it dry and then do the acid wash. That will leave variants in the effect that will look like japan enamel (gilsonite) that's worn off over the years. This is really an incredible way to waste my breath (fingertips) but its fun anyway. 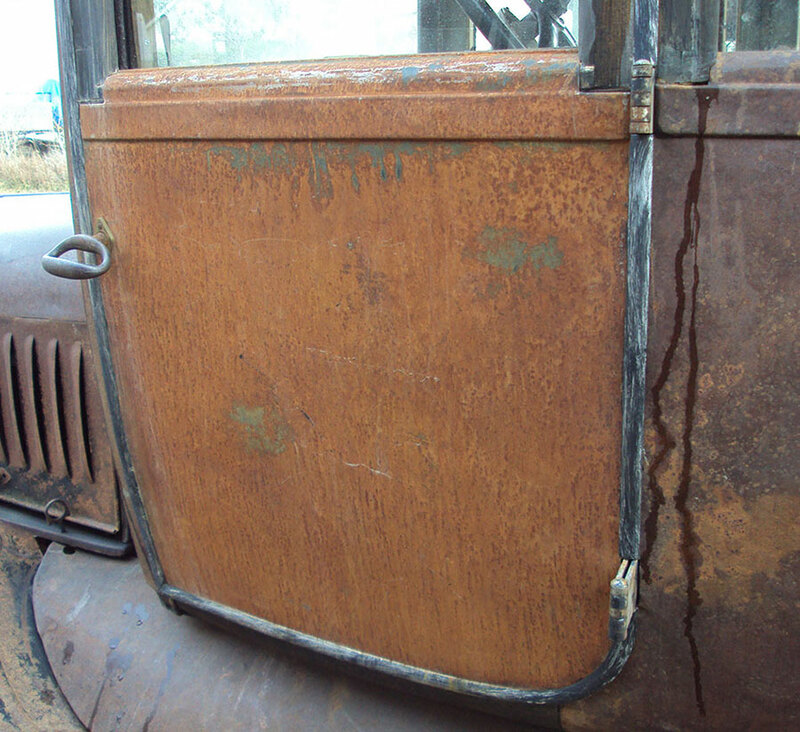 The best ways are to keep the 'patina' that is there, and then find most parts to match, or paint to match. The painting needs to be creative, and using different primers or paints and removing layers with sanding too, then crinkle finishes can also be added. 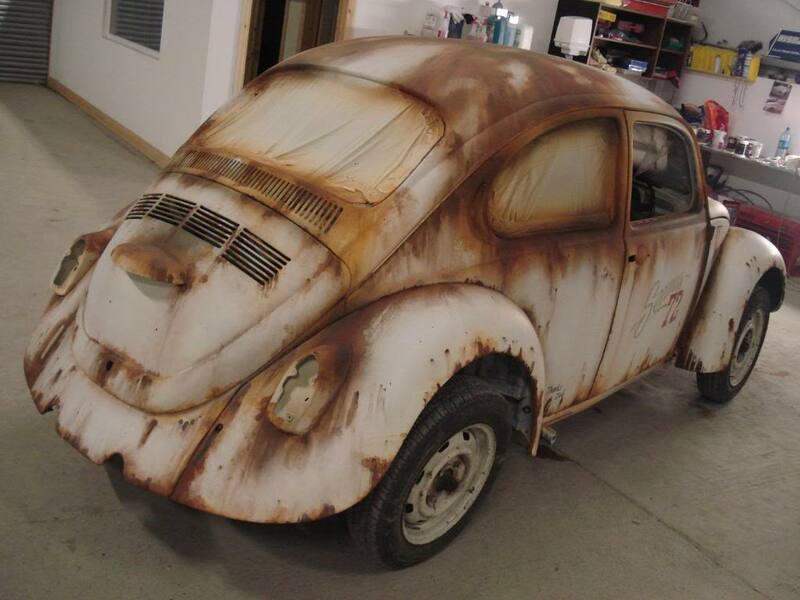 If you Google 'faux patina auto paint' lots of info on the web. 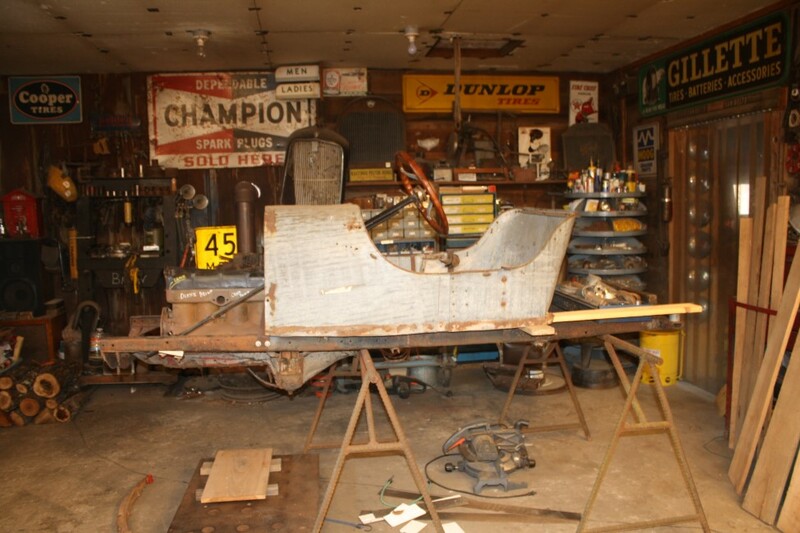 Here is what I did to a car on which I wished to create a fake patina and still preserve the steel. I sprayed a few coats of black primer on it. That gave it a dull finish. Then fog over that red oxide primer. You can spray the red in patches or just fog it on or a combination of each. That gives the appearance of rust. I made this door skin and then daubed a little paint on it and sprayed it with salt water. It took several days. 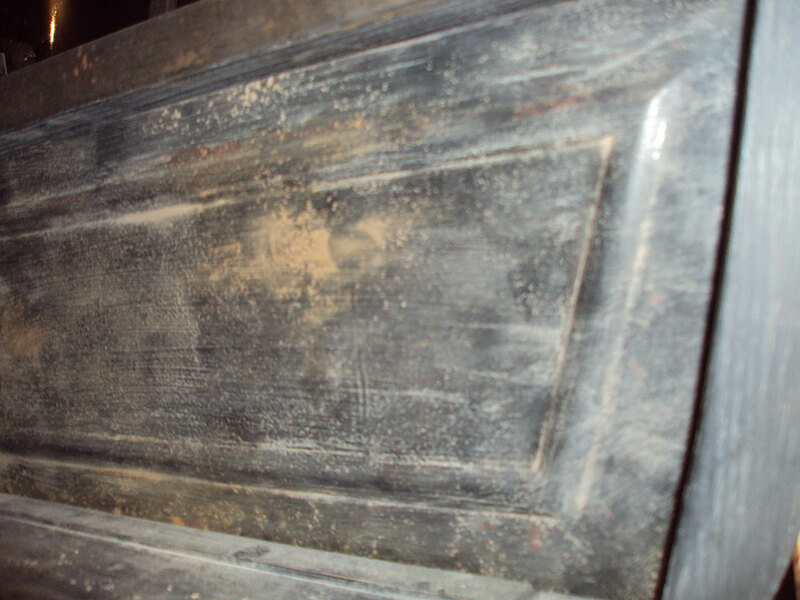 The hinges and molding were new too. The lower panel was rusty so I wet sanded it enough to smooth the surface and then brushed some flat black enamel on it using lots of thinner and then daubed some gloss black around the edges and places that wouldn't see any wear. The next day I rubbed it with a scotch-brite pad and muddy water in a random pattern. When that was dry I rubbed it randomly with a dirty rag. The problem with patina is it isn't even but a collage of colors and textures. I also use a slurry of rusty water from wet sanding to daub on here and there. If you study a car that has the patina you like you can imitate that pattern. Mother nature will do the rest. This doesn't wash off quickly but could be re-applied if necessary. Clear coats or linseed oil will leave a sheen or gloss and I don't use them. Interesting thread, thanks for getting it started. My small contribution is the technique I used to age new frost plugs that went into my 1947 Dodge engine rebuild � fully overhauled internals but looking as original and untouched as the rest of the car. First photo shows the progression: new frost plug, belt-sanded, sandblasted, vinegar rinsed, and hydrogen-peroxide dipped. 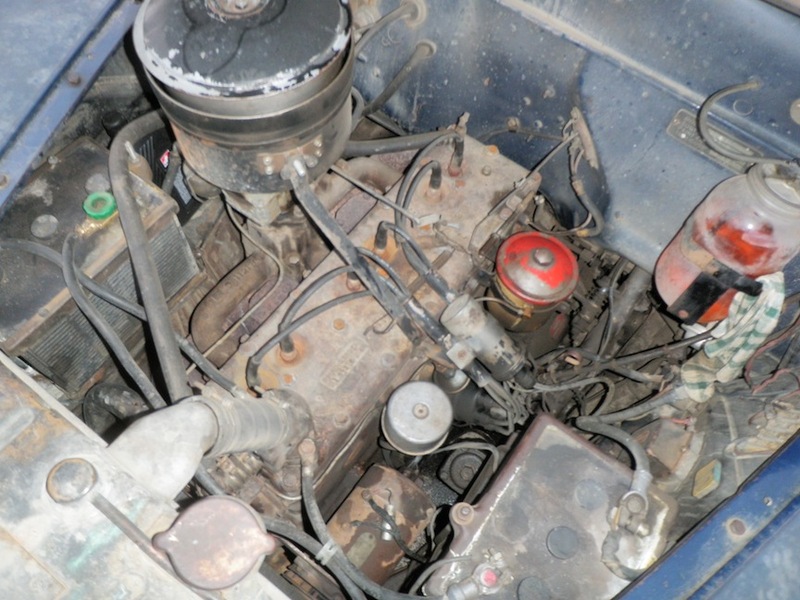 Second photo is the rebuilt engine back in the car. From reading this thread so far, I could probably have saved a few steps on my frost plug project by going straight to muriatic acid! I'm sure some are skeptical about applying mud but the two tops above were new material coated with mud on a sponge. The Roadster a dozen years ago and the Coupe 3 years ago. They have remained outdoors in Idaho winters and the moderate rain we get and not re-mudded. now thats a dirty trick! I've used boiled linseed oil cut with mineral spirits to PRESERVE patina (the sheen it leaves tones down after you wipe off the excess and it sits for a week or so). Thanks, There were several good tips above I have not heard of before. Im lucky as the vast majority of my parts are already aged,(with real, old, honestly earned, vintage, genuine, authentic, patina) . So Ill just be aging a few of the items. I would like to do a little to help preserve the parts. That is why the linseed oil interested me. In the old engine world, just completely oiling every inch of the engine and then wipe it back off gives a good well used look. Ill have to experiment some, but I wanted to hear as many ideas as I could before starting. 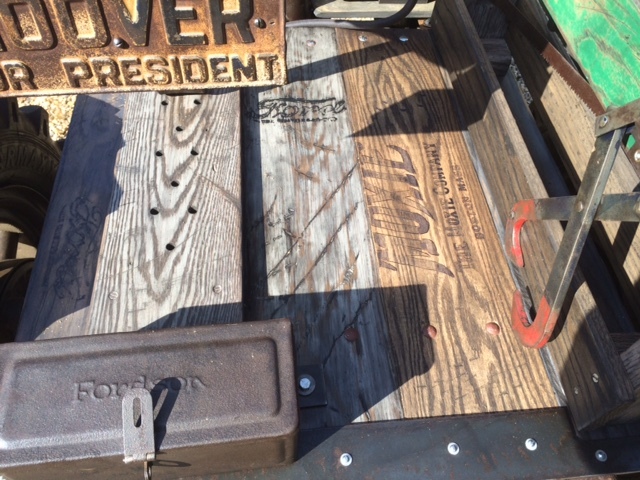 I had also thought about light sandblasting the wood, and also light wood burning as aging for the wood items. There will not be much wood showing. Most will be covered by upholstery and floor mats. Dan, The article you are talking about was my 14 Touring. It was published in the March/April 2011 edition. I listed what I did step by step in that article. No one has ever questioned the originality of the car. When someone says "don't ever touch it, it is only original once" then I tell them what I did. Sometimes they don't believe me. The reason I did it was that it was an original car before it burned, and I wanted it back to that look. 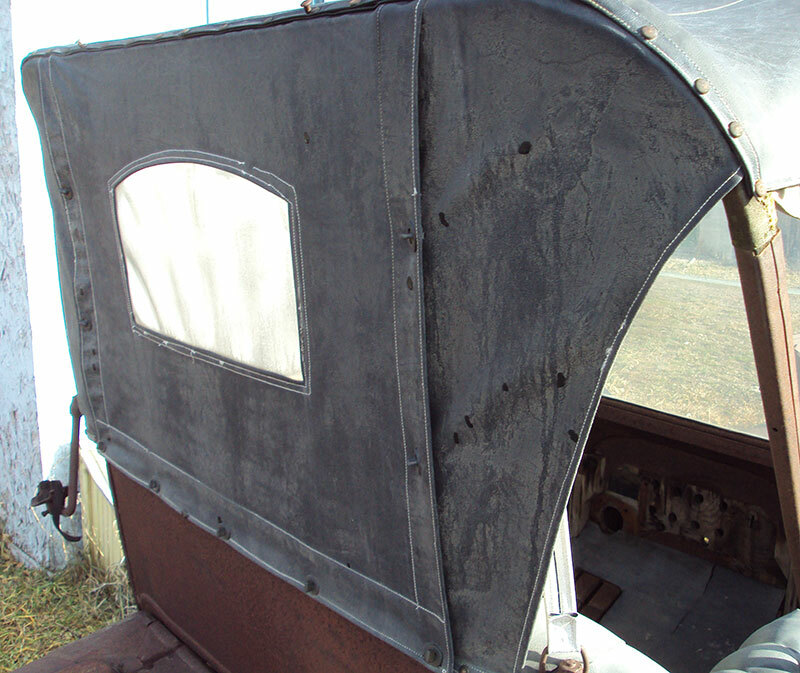 I was fortunate to have a lot of original interior pieces to put it back together. 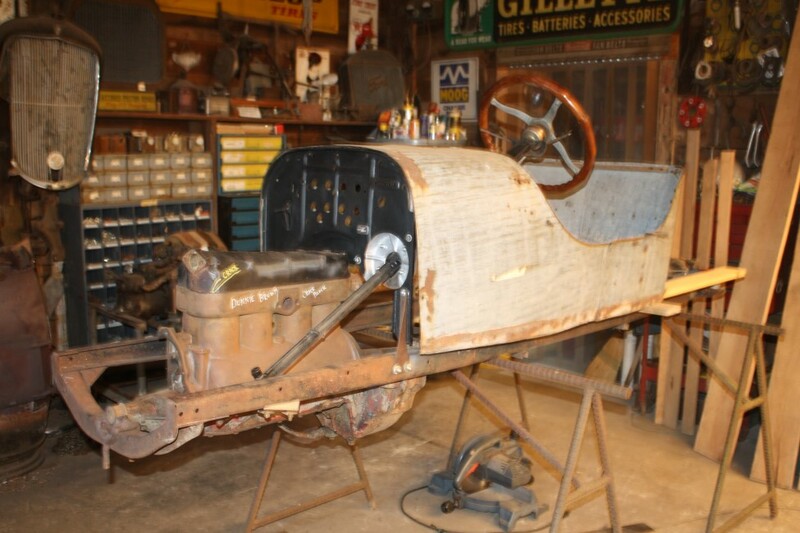 Except for the seats themselves, the interior is all original Model T. Since that time I have come up with original seats, but unsure if I will change them.